I have serious problem, how to make that WC/Co/4%Cr coating sprayed by HVOF (MicroJet system) on plunger (max pressure 200bar, work in pair with bronze hub) could work. After one month of working coating in some places go off. And in one place coating is? ?as a bubble with several small gaps.? ?I am attaching pictures with defects . Can anybody to explain it. Coating thickness was 0.3mm on side after spraying and 0.1-0.15mm after grinding. After spraying? ?surface was painted with thick sealer layer (that moment temperature of coating was 20C). If you have problems just email the image files to me and I will host and insert images for you. Thank you Gordon that You attached pictures. Maybe You can to comment it. Where I make mistake. I can see that the surface you coated at most of the area is ok after grinding/machining. The defect came out at only certain area. Right? So, this is more to a localized defect. The bubble can not be seen very clearly, but it should be some typical voids caused by coating pull-out during the grinding. These may be due to some unmelted particles.. The peel-off area seems more to a surface preparation problem. 1. Make sure your parameter used to spray is optimum which has no unmelts. 2. what is the distance you are spraying at? have you tried to adjust (increasae stand-off) and see if such defect persist? 3. Have you looked into the surface preparation? Degrease, a proper grit blasting, and avoid potential contamination on the part. 4. Did you ensure all the old coating/previously coated material is thoroughly removed before the spraying again, as this would happen very frequently because a new coating would not adhere to the old one. 5. If all above has been taken care off, you may want to review your machining or grinding process. The tool you use, is it a single point cutter? or others? the RPM and other set-up. Coating not suitable for application. 1. Function of the component? 3. Seal material or working direct on bronze? 5. Does the damaged area coincide with position exposed to highest pressure? 6. Which coating sealer? Applied before or after grinding? 7. Assuming substrate is exposed, does this give any clues to reason of failure - corrosion products or poor grit blast profile? 8. Does the coating and it's finish appear normal to you (apart from the failure )? 9. Any other clues that you think may help? 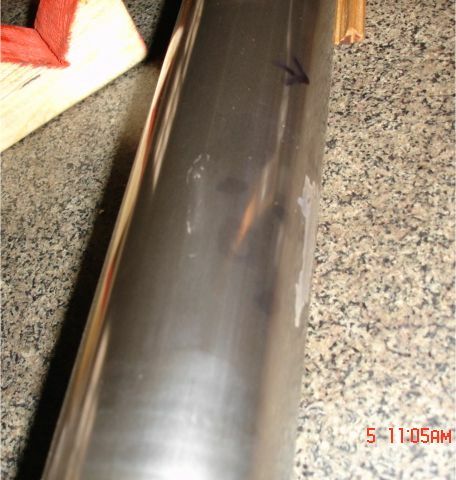 I have seen very similar failures on compressor piston rods, although these work at much higher pressures. One thought then, was failure through "hydraulic jacking" and fatigue via porosity and pinholes. About degreasing ? what kind of solution must be for degreasing? Preheating was performed after grit blasting with flame of HVOF gun. Temperature reached about 80C-90C. Max. temperature during the spraying didn?t exceed 135C. Several time for this reason we just stoped spraying. What type sealer must be? Where I can buy it? We buy wheel from sulzer metco. And all process of grinding was performed very gently and slowly. Maybe it is possible to get any regimes ?
? Coating not suitable for application. What type of coating You suggest? Applied before or after grinding? What do You mean poor grit blast profile?? hydraulic jacking - they said it is impossible of it . One more thing I checked that on plunger there is bend of 0.06mm. Quote: what kind of solution must be for degreasing? One that removes oils and grease. Sorry, I mean there are many commercially available degreasing solvents and cleaning systems to choose from. The important part is that your substrate needs to be clean and oil/grease free before you grit blast. It may be an idea for a separate discussion thread on the pros and cons of different cleaning systems and solvents. Substrate surface preparation is the most important part of any coating process. Get this wrong and what follows is pointless. I will assume you are experienced with providing thermal spray coating and are very aware of this fact. So, I will assume that preparation is not a likely cause for your coating failure. Quote: Preheating was performed after grit blasting with flame of HVOF gun. Temperature reached about 80C-90C. Max. temperature during the spraying didn?t exceed 135C. Several time for this reason we just stoped spraying. I am not familiar with the MicroJet system, and can only guess to the quality of your WC/CoCr coating. Have you evaluated this coating? What thickness of coating do you apply per pass of the gun? Again here, I will assume your coatings are fit for purpose and are not likely to be the cause of the failure, particularly if you have similar components in service which have not failed. We buy wheel from sulzer metco. And all process of grinding was performed very gently and slowly. Maybe it is possible to get any regimes? Additional super finishing may be worth consideration. Again assume finishing unlikely cause of failure. Quote: ? Coating not suitable for application. I don't think this is an issue here, particularly if other parts performing well. Is there any other signs of coating damage/wear that we can not see from the photographs? Quote: 6. Which coating sealer? What sealer type/product did you use to seal the coating? If your coating contains 1% or less porosity, chances are that grinding will just remove all your applied sealer. It is debatable whether these coatings actually need sealing. A better option would be to seal after grinding. WARNING - if sealing after grinding make sure coating is clean and COMPLETELY DRY (if wet grinding) before applying sealer. I have seen corrosion failures where grinding coolants/moisture have effectively been locked in by sealing. Linseed oil, phenolic, anaerobic type sealers will probably be ok. A low viscosity epoxy based sealer vacuum impregnated would possibly be the ultimate choice. I would suspect that the ceramic coating has failed in a similar manner to the tungsten carbide coating. If the coating is not exposed to the pressurised fluid then I agree hydraulic jacking and subsequent cyclic fatigue could be discounted. On the other hand, if it is exposed to cyclic pressure changes, then I think this should not be dismissed as impossible. Quote: One more thing I checked that on plunger there is bend of 0.06mm. Not sure if that's enough to cause a problem, but I would not dismiss the possibility that the coating itself is not to blame. I think you really need to get a thorough evaluation of your coating and failure. It may not tell you exactly what caused the failure, but it should at least help narrow down the list of culprits. Good luck in finding an answer to your problem. 1. In WC-CO thermal spray coating by high energy processes,it was found that cobalt reacts with dissociated W & C and the molten product on deposition solidifies as amorphous material.In such a case, post coating heat treatment at 860C leads to recrystallisation and improved wear resistance. 2.I do not know the surface finish requirement in your coating.Generally surface finish of compressor piston required is around 0.45micron.You need to do multiple grinding stages to achieve the required finish. With low rate of removal at each stage and appropriate grinding wheels it is possible to get crack & porosity free surface finish.You can do a dummy grinding and check the surface for flaws by suitrable NDT technique and also by etching. Alternatively, you can opt for automated spray-fuse system using a appropriate Ni-base self-fluxing alloy of suitable hardness, where you would never encountered coating peeling problem. Long back we have successfully replaced hard-chrome plating by spray-fuse coating on compressor plungers for one compressor manufacturer.We developed a custom powder and by series of trial established appropriate parameters for spray and fusion.Indian company had collaboration with a leading US manufacturer, who in turn approved our process.The process is successfully running over 2 decades. Please do not hesitate to write for further inormation. This problem still exist for me. You suggest to apply self fluxing coatings. I thought also that it is one of the best solution , unfortunately coating (NiCrBSi, NiCrBSi+WC) wears out too quickly ( in three month). Till now I don?t understand it. What is the differents among linseed oil, phenolic, anaerobic type sealers? What permissible delay between blasting of substrate and spraying WC/Co/Cr? What size of aliuminium oxide is optimal for blasting? Surface of plunger will be prepared by grinding. Question : Is there any differens how to prepare surface by turning or by grinding? Is it ok that coating thickness would be between 0.15-0.20mm on side (after grinding)? What about cooling of substrate surface by air during the spraying time ? Which solution is better to cool or to stop spraying and wait several minutes? Preheating temperature after blasting with the flame up to 100C - is it enough? Preheating must be done only for surface or in all volume? Quote: This problem still exist for me. You suggest to apply self fluxing coatings. I thought also that it is one of the best solution , unfortunately coating (NiCrBSi, NiCrBSi+WC) wears out too quickly ( in three month). Till now I don?t understand it. If you want to try fused NiCrBSi+WC coatings again, try HVOF spray with a 50% WC content powder (graded for HVOF like Diamalloy 2002), you will find these coatings easier to fuse and superior quality than the typical flame spray and fused coatings. Abrasion resistance will not be as good as HVOF WC/CoCr, but should be much stronger/tougher and will be very much more resistant to the type of failure you are experiencing. Quote: What is the differents among linseed oil, phenolic, anaerobic type sealers? Suggest around 5 micrometres coating thickness per pass for HVOF WC/CoCr is best. Quote: What permissible delay between blasting of substrate and spraying WC/Co/Cr? Best practice is to spray immediately after grit blasting. Permissible delay depends very much on the environmental conditions. Typical procedures tend to suggest 4 hours maximum. Quote: What size of aluminium oxide is optimal for blasting? Quote: Surface of plunger will be prepared by grinding. Question : Is there any differens how to prepare surface by turning or by grinding? Substrate preparation? shouldn?t make much difference. After coating? by grinding only. Quote: Is it ok that coating thickness would be between 0.15-0.20mm on side (after grinding)? This sounds ok, but it does depend on the permissible wear limit. Quote: What about cooling of substrate surface by air during the spraying time ? Which solution is better to cool or to stop spraying and wait several minutes? It would be best to be able to spray without pause, using air-cooling to control temperature if needed. Reducing the coating thickness per pass (as mentioned above) will also help even out the temperature distribution. Quote: Preheating temperature after blasting with the flame up to 100C - is it enough? Preheating must be done only for surface or in all volume? 100 C should be fine. Higher temperatures could be used, but care must be taken not to oxidise the surface. Ideally preheat should be even throughout work piece, not just surface. Today I had small conversation with man from sulzer , about WC/Co/Cr coating thickness. And his answer was very interesting. If there is corrosion the best coating thickness on side is 0,25-0,30mm. And if it would be less coating can pull out. Reason of that he mentioned porosity : If coating thickness less .... for example 0,15mm than porosity will be bigger. But how porosity have relation with coating thickness? It is true that thicker coatings can provide an increased barrier effect. This is not in fact due to differences in porosity between thick and thin coatings, but mainly that you stand more chance of blocking the external environment from finding its way through to the substrate. If your problem is down purely to corrosion, then a thicker coating may help. If not, then a thicker coating may actually make things worse. 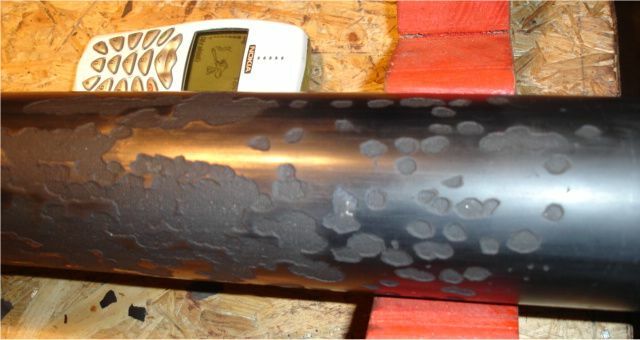 As Gordon has pointed out, thicker coatings provides barrier to corrosive fluid for a longer time period but runs the risk of residual stress build-up across the section.Benefecial compressive residual stress on the surfacce due to blasting decreases with the coating thickness and above around 1.5 mm thickness, the damaging tensile residual stress starts building up. 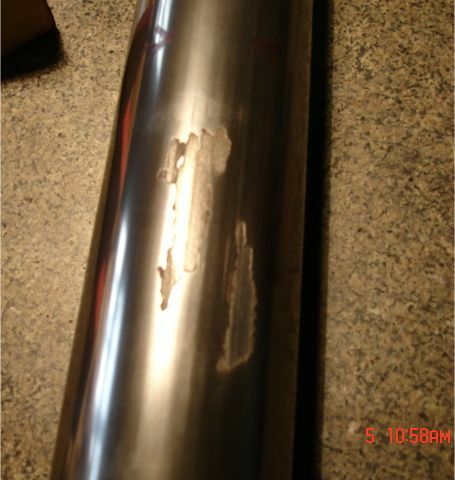 Corrosion like wear is environment specific.Ineractive corrosive media needs to be defined with respect to pH,composition etc to find the right kind of material.Technical water containing some lubricating additives does not sound to be sound to be a very aggressive media. The effectiveness of WC containing spray and spray fuse material can vary widely amongst the commercially available products.You can possibly ask for Standard lab.Wear Test data for the same product from more than one manufacturer. Also as suggested earlier,try normalising the coated surface. Today I tried to spray one plunger and there were one strange thing . During the deposition, flame stream sometimes is changing . I guess that powder injection into the gun from feeder isn't constant???? And after I stop the spraying I saw on the surface something similiar to coagulation of powders and that take off very easy. This may just be coincidence, but I would put this to the top of your list of possible causes for your failures. Unstable powder feeding will effect your coating quality (porosity, unreacted particles, bond and coating strength etc.). Time perhaps to check your feeder for leaks, service and calibration. Maybe your powder just doesn't like your feeder, in which case change your powder or supplier. Maybe your powder is not stored or handled in the best way (damp "claggy" powder will not feed well), suggest storing powder in dry and heated environment to avoid moisture absorption. Today we checked the gun . And I think that the reason of those unreacted powders is that powders adhere to the inside surface of long air cap during the spraying time then start growth to the particular size while hot gas stream detach it and deposit on the surface.